This is less than a mile I would say from the Millennium/Principality Stadium, with numerous pubs to watch the games close by. Doors open at 12pm on Sunday 20th September. Just the ticket for Wales’ opening game versus Uruguay. 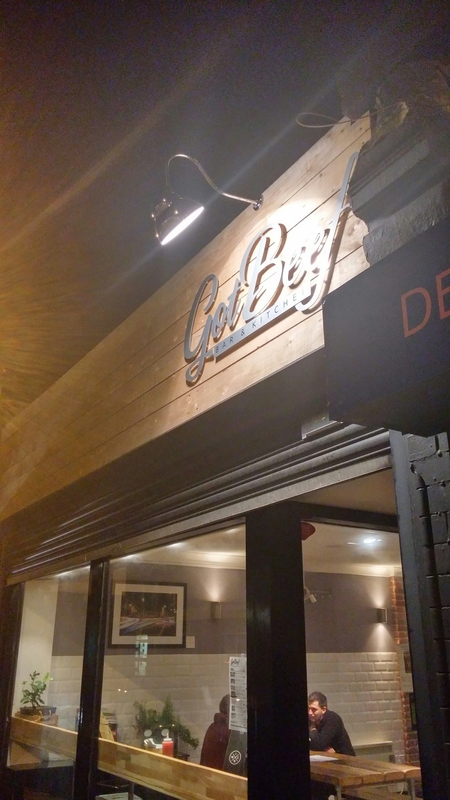 My review of what to expect (based on a visit to their place on Whitchurch Road) is below. With all the hype surrounding the arrival of Five Guys in Cardiff, I thought it was high time I got around to trying a local establishment that has been creating waves on the burger front in Cardiff for a while now. With Mrs. SF and the dogs away for the week and a busy week in work, by Wednesday I couldn’t be arsed to cook anymore and hate ready meals. It was therefore a choice between a takeaway or eating out. Not being a massive fan of takeaways (although Hokkei is a notable exception to this rule), I went for the eat out option. Got Beef, with it’s nice informality, seemed to more than fit the bill and is located only a relatively short detour from my usual route home. Set up by founder Cai Pritchard , orginally as a food truck/bus, then a pop up, before moving into permanent premise (next the world – watch out “Five Guys”!! ), it has built up a formidable reputation locally for the food on offer. It is quite minimalist inside with a open kitchen and an eclectic mix of chairs benches, stools and a variety of different size tables. 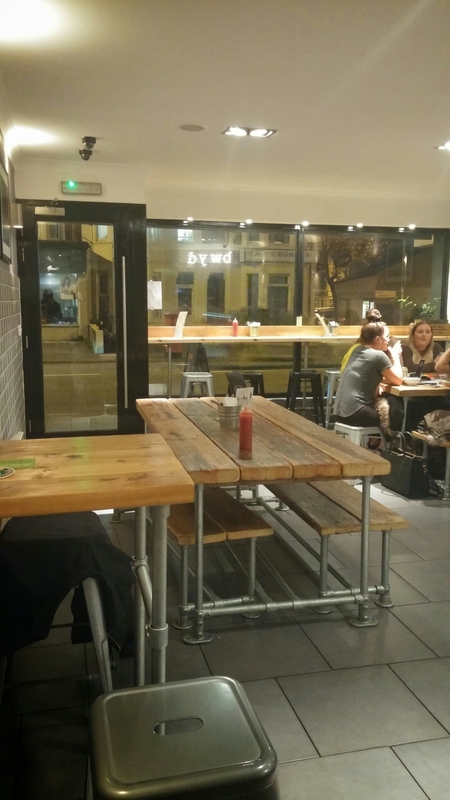 This is perhaps not a place to linger for too long, unless you bag one of the larger table and bench combos but it does have an outside area which sounds quite nice for when the evenings start to draw out and warm up. I was, as a solo dinner, placed on one of the smaller tables with a somewhat uncomfortable (even with my more than ample padding) stool to sit on. The waitress showed me the ropes in terms of menus and ordering (at the counter by the open kitchen) and I was good to go. A simple, efficient set up which I liked. 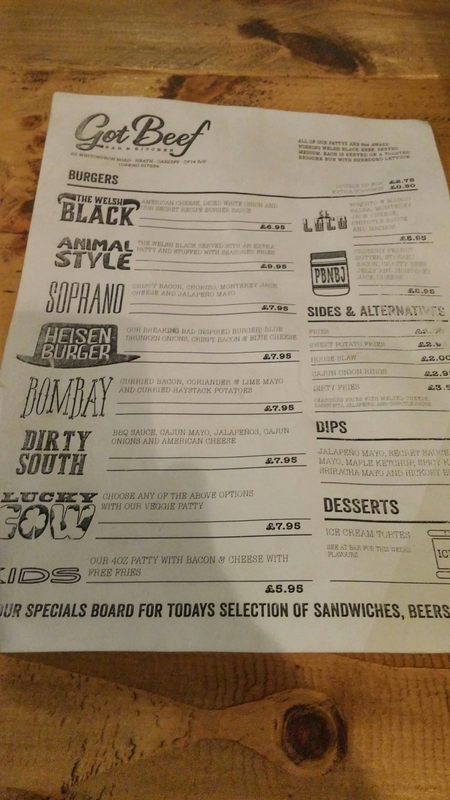 The menu is all burgers (of course) ranging from their most basic burger (a Welsh black beef 6oz cheese burger) to more exotic ones, such as the Heisen, Soprano and Bombay burgers. Not sure about the PBNBJ burger, which has peanut butter and beer jelly in the mix. Big fan of Elvis me, but that doesn’t necessary extend to his eating preferences. Mind you I like satay, so maybe it would be my thing. All their beef patties are made from local sourced Welsh Black beef. Nice to see a local business supporting local producers – how it should be. 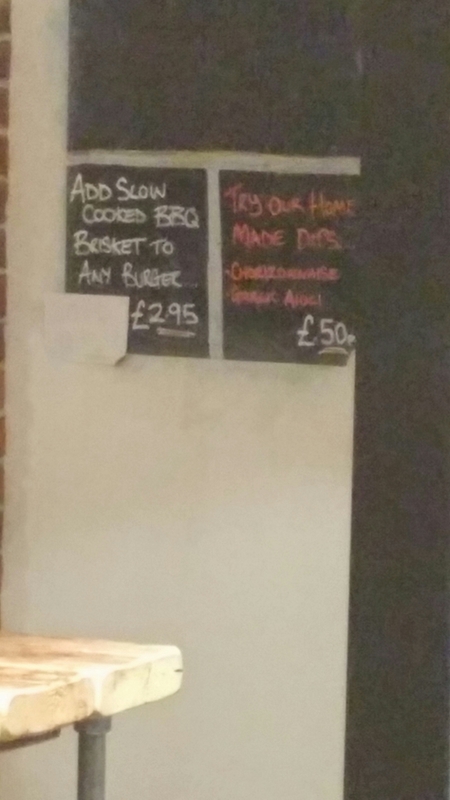 They have specials (burgers, beer and wines) available daily on a board (none left at time of my visit) and the ability to add home made brisket (for an extra £2.95) to your burger. Non beef eaters (why are you coming to a place called “Got Beef” is the obvious question) are catered for with the “Lucky Cow” burger (a veggie pattie that you can pimp up by substituting the beef for their veggie patty in any of their burgers). I know is was meat free week at the time of my visit, but it was always going to be beef and in my defence I was not alone in opting for it over the veggie patty. It is after all called Got Beef. Prices for burgers range from £6.95 up to £9.95 for the fries stuffed double patty “Animal Style”. For veggie patty there is a flat price of £7.95, which seems a bit odd. As it states you can substitute the veggie patty for the beef in any burger, does that mean for “The Welsh Black” veggies pay a £1 supplement over the price for beef, but get a bargain if they do the same with say the Loco or PBNBJ burgers? If I have understood it correctly, that seems strange pricing for veggies. I wasn’t feeling the need for anything too fancy so went for their most basic (and cheapest) burger, “The Welsh Black” (£6.95 without fries). This is a single 6oz patty, topped with American cheese, crunchy diced white onions and a tangy sauce and shredded lettuce – all sitting within a toasted brioche bun. I asked for my burger to be cooked medium rare and this request was met without the bat of an eyelid. It was a size whereby I could easily pick it up and eat it with my hands (essential in my eyes for a burger, as that is why it comes in a bun!) with the bun being nice and soft (and not dry at all). This enabled the whole shebang to be squeezed down for easy access to my big gob. The sauce and cheese on the burger did made it a slippery devil, with the patty constantly trying to escape the confines of the bun. It was cooked bang on the money – medium rare. Exactly how I had asked and exactly how I like my burgers, with a nice exterior crust, a lovely pinkiness to the interior and a yielding texture. It was properly seasoned and tasted bloody good, with a great beefiness to it (so often missing from burgers). The accompaning sauce was good as well – being nice and tangy. Really not much more you can ask for really from a burger. It is so rare (excuse the pun) to get a burger done exactly as I like it (other than cooking it at home). It made me happy. If I was being ultra picky, the American cheese could have been a bit more melted and gloopy but if you gave me the choice of more melted cheese or a rarer burger I will always choose the later. Also I don’t much like food being served on boards instead of plates, but that is just me. 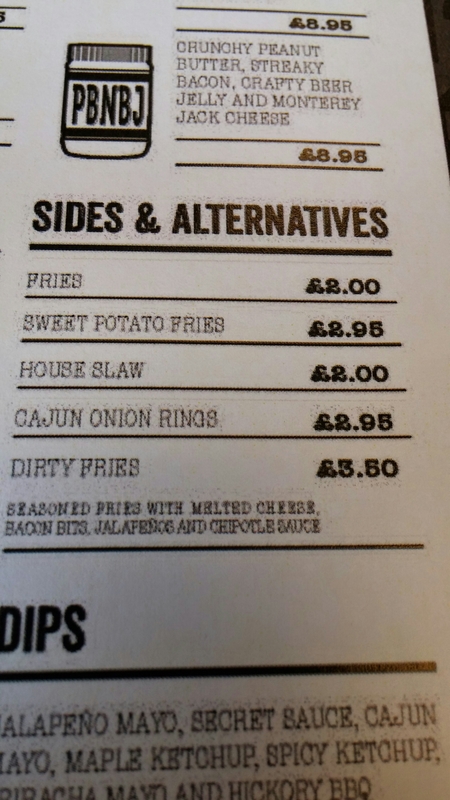 On the sides front (costing between £2.00 and £3.50), they have a variety of options covering the usual staples of fries, onion rings and slaw. 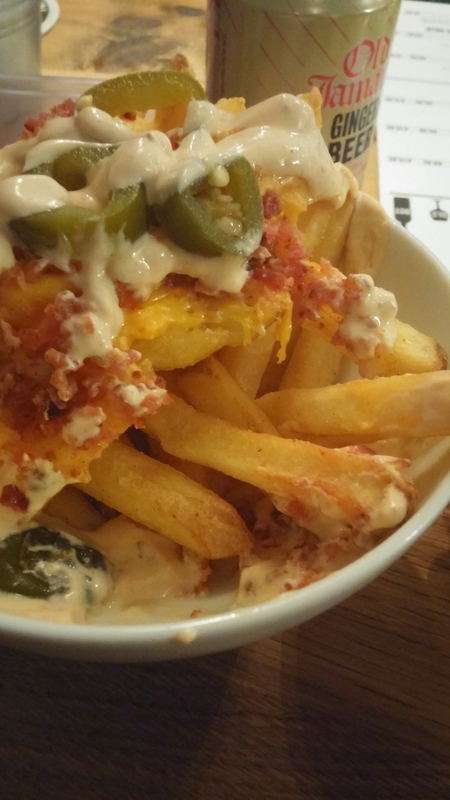 I went for the “Dirty Fries”, a delicious combination of crisp on the outside, fluffy on the inside seasoned fries, melted cheese, bacon bits, jalapenos and chipotle cream. and the perfect foil for the simple burger I had. On the booze front, they have a nice selection of craft beers (doesn’t appear to include any local stuff from Welsh which is a shame – maybe they feature as specials) and a short, slightly boring (but fairly priced) wine list, with some particularly dull whites on it. 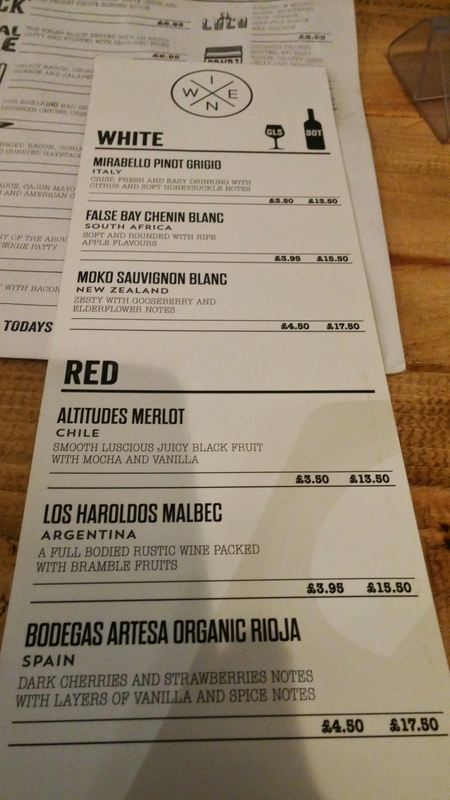 I would have liked to have seen something more interesting and food orientated on there, like a Gruner Veltliner (white – very versatile food wise and good with spice, so think the Bombay burger) and maybe a Barbera d’Asti (a bit different, but a very good red wine pair with burgers). 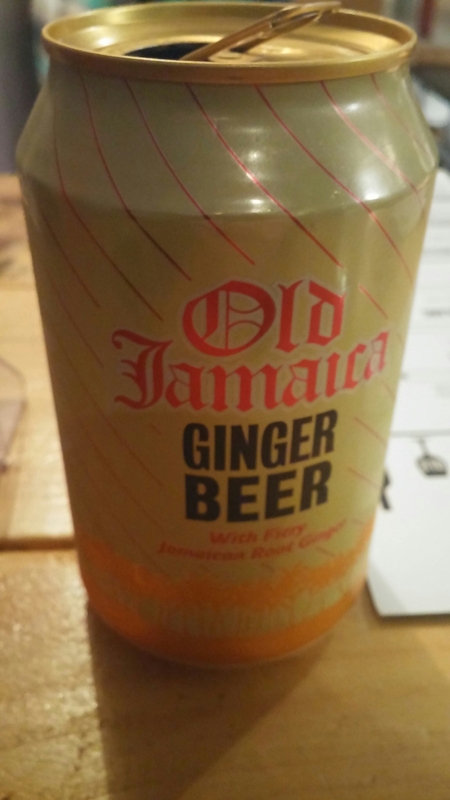 I was driving and make it a rule not to have even one alcoholic drink when doing so (if do I only want another one and then feel cheated that I can’t), so it was a soft drink for me in the form of a ginger beer (£2). This came nicely chilled with a glass and ice (amazing how many places don’t get this right and give you unchilled soft drinks – it is the little things) and pleasant enough. I really enjoyed my burger and dirty fries at Got Beef. 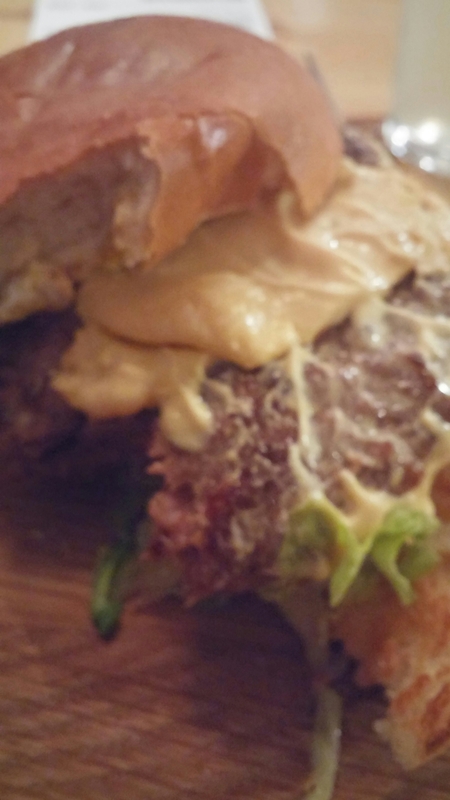 The burger was first rate on the flavour front and cooked exactly how I like it. 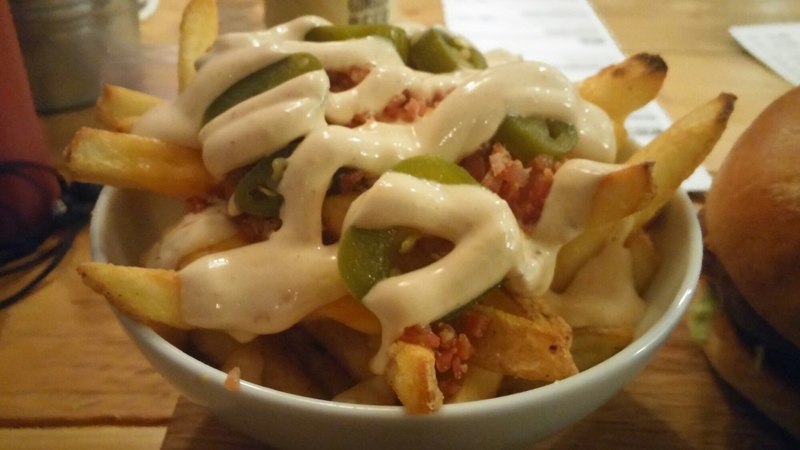 The dirty fries were indeed fabulously dirty and a perfect accompaniment to my burger. 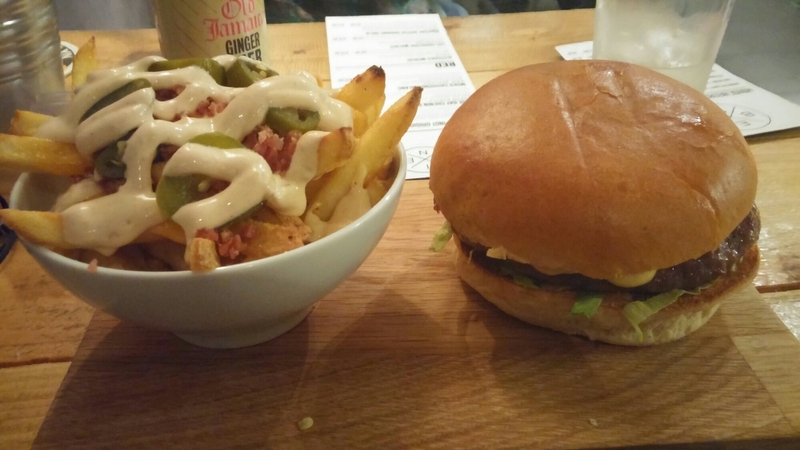 Price wise, my burger, dirty fries and drink came to £12.45 (without tip). For the quality of what I got I thought that was pretty good value. 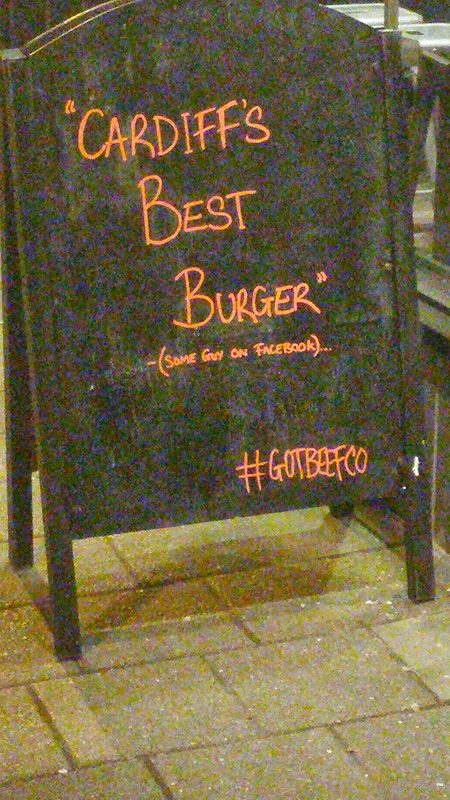 A sign outside states “The best burgers in Cardiff (some guy on Facebook)” and it is a sentiment that is hard to disagree with on the basis of my visit. Not quite Dead Hippie, but pretty darn close and a lot shorter journey wise to get to. Saying that Meat Liquor is opening in Bristol in April so is edging closer. If they ever make it to Cardiff (which would be nice) they will find a worthy adversary in Got Beef. Five Guys , in my eyes, will do well to get close to these guys. Would I go back? 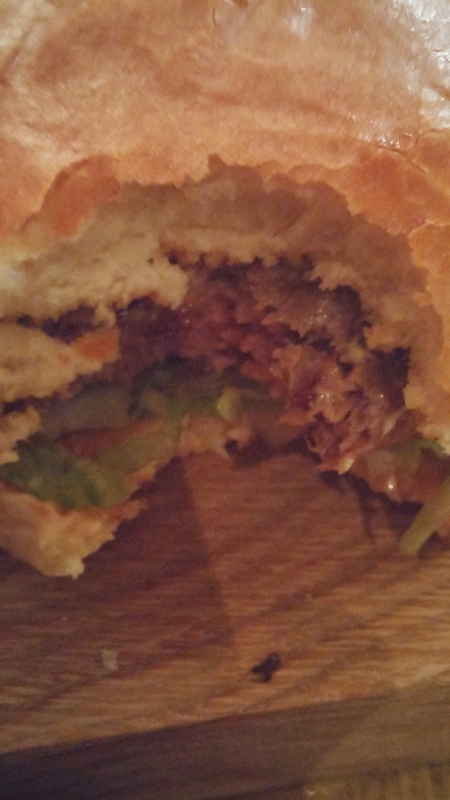 Hell yes – it is a rare and precious thing to find a place that cooks a burger exactly how I like it. They offer takeways as well as sit down eating. Sounds like a great place and definitely worth a visit when next in Cardiff-informative review and photos to show off the delicious looking food. Bit of a worry. Hopefully they are getting it sorted and they will get better score when revisited 😦 I see on Food Standards Agency website that they have been reinspected and a new rating is to be published soon. Hopefully! Again, bit of a worry, these revisits seem a bit of a cop-out when the original inspector deemed it that bad! I have checked up on their score and is now a 4 – good – based on inspection in September. So seem to have addressed the issue. This entry was posted on Mar 29, 2015 by solicitingflavours in Austrian Wine, Beer, burgers, Cardiff, craft beer, Drink, Food, Food and wine products, Got Beef, Italian wine, Non alcoholic drink, Restaurant Review, Sandwich, Take away, Wales, White wine, wine.